On April 8th at 9:15 am, we will meet at the Hometown Heroes Park in the lot next to the soccer fields, to the right from the entrance off of FM 96. We will ride together in our own vehicles, carpooling to Jimbo's Nursery in Santa Fe. Our appointment with them is at 10:00 am. Members may meet us at the nursery at 10:00 if they will not be carpooling. 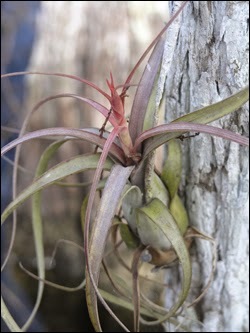 The nursery will provide a demonstration on arranging and caring for air plants and those who wish, can make their own creation for approximately $15/craft. The demonstration is free and the only cost is for the optional make and take craft or for any incidental purchases at the nursery. Next, at approximately 11:15 am, we will drive to Haak Winery (10 min away) and arrive for our 11:30-12:00 appointment for lunch. Lunch at the winery will include a garden salad, bread and Tuscana soup (potato, sausage, kale) for a total cost of $20.93/person including all taxes and gratuities, which is each member's responsibility. At the conclusion of lunch we will return to Hometown Heroes Park by approximately 1:30 pm. For directions to Hometown Heroes Park, click here.